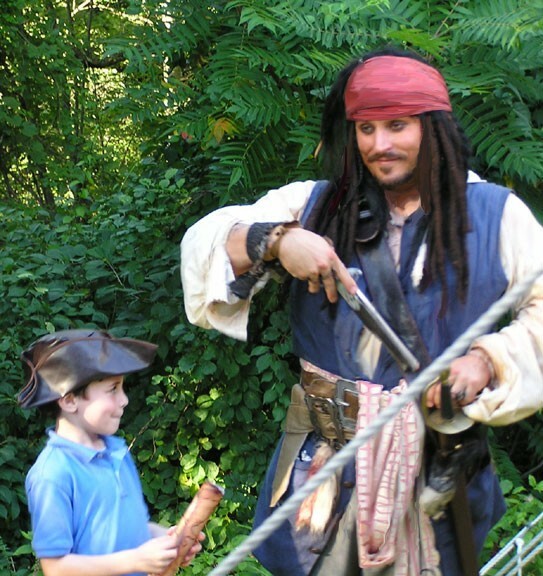 Have the best Jack Sparrow impersonator pirate entertainer for your childlen's birthday party or corporate event or any party in the Boston area for $250 for one hour, $350 for two hours. Hire the best Boston pirate entertainer Jack Sparrow impersonator for your corporate event or party in Massachusetts, EMAIL US TO REQUEST YOUR DATE We also provide other pirate characters and entertainers in authentic period clothing for your event. Our pirate characters are popular at a kids pirate theme party or any type of children' s party including a pirate and princess party. 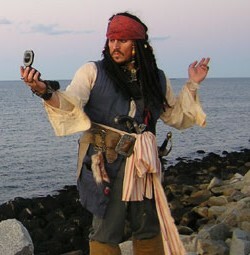 Jack Sparrow parody makes a perfect MC or host for your corporate meeting, company picnic, or public event and any adult pirate party. For a kid's pirate birthday party Jack will surprise the kids when he appears and will proceed to proclaim the piratical virtues of the birthday child and then initiate the birthday child as an honorary pirate Captain. He then makes all the guests into a pirate crew for the birthday child to act as captain over the crew. There is a treasure hunt and then the pirate sword fighting training game.